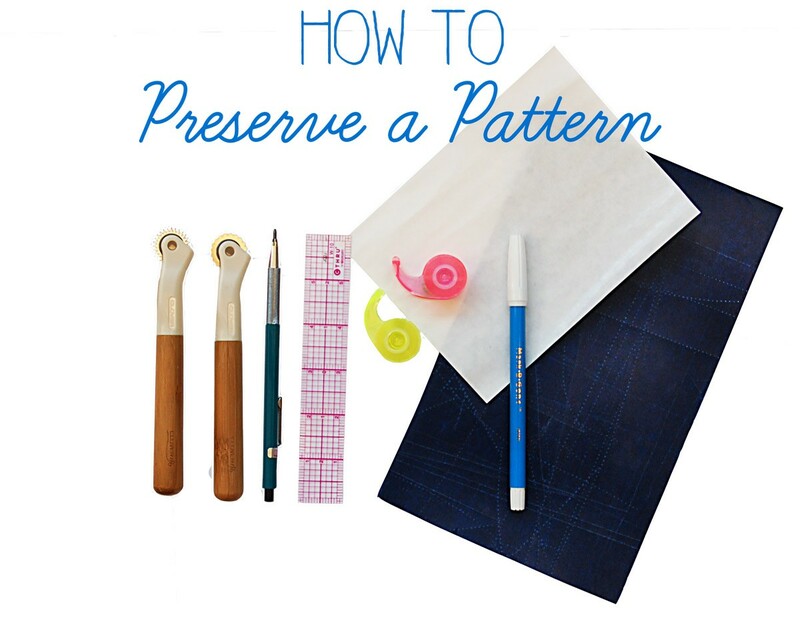 There was a discussion on the forums a while ago about how to trace a pattern so you can preserve the original. My favorite method is to use Canson tracing paper to trace my pattern pieces. But there are many other products and methods you can use, and our wonderful forums moderator Sarvi has generously offered to tackle the subject for us. In fact, she wrote four blog posts about it, and she’ll walk you through the most popular methods. So I’m going to turn the blog over the Sarvi for a few days and let her explain it all to you. Thanks so much, Sarvi! Like a lot of us, I “grew up” as a sewist with Oliver + S patterns. 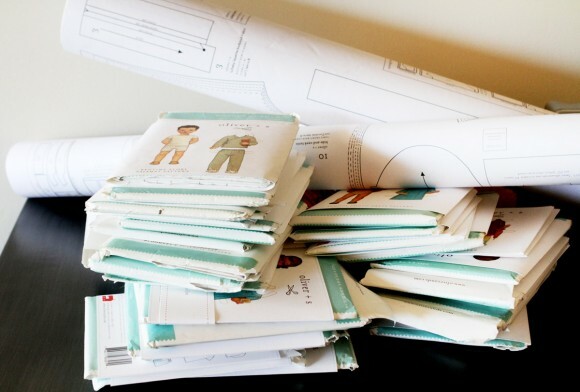 I remember my first pattern with the paper doll vividly, so I have a sentimental attachment to my patterns. Some folks are natural-born archivists who want to keep their patterns in good condition for their own re-use or maybe even hand them down to the child wearing the clothes now, who will, after all be old enough to sew one day. If the intended wearer measures between sizes (for example, a size 3 at the chest but needing a 5 in length or differently-sized twins) you might find it easier to try out adjustments on a copy, rather than the original. And perhaps most practically, you might want to make the same garment in more than one size as your child grows. Many of the pattern pieces are nested, with the smaller sizes tucked inside the largest piece, but some are stacked and fanned, and for these pieces it will be inconvenient to try to cut out one size while preserving the usability of the others. There are a variety of substrates (like freezer paper, Swedish tracing paper, and interfacing) that can be marked with a variety of tools (pencils, chalk, transfer paper). You have a lot of freedom in combining tools and techniques to find what best suits both your project and your personal preferences. Coming up over the next three days, I’ll walk you through some of the most popular combinations. Updated: here are the links to all of Sarvi’s posts. Great topic! I’m always trying new methods for tracing. Can’t wait to get a few more tips. Looking forward to it, Sarvi! I have been wondering lately…. Is there a better way? Can’t wait to learn some new tricks!! Who would have thought sewing supplies could be so elegant? I’m actually curious about the Oliver + S forums. How does one join these forums? Why to preserve a pattern: because I have 5 daughters and one dress pattern can cover 3 of them, all different sizes. So I trace. I just use regular tissue paper, a felt tip marker, and shine a lamp straight on it when I’m tracing because that’s what I have. I’m interested to see the more professional method of doing so, and I’ve always wondered what those tools were for. I”m looking forward to this too. I used my tracing wheel for the first time yesterday (I just traced over the pattern+fabric and it left enough of an indentation for me to cut) and it made things so much easier! I’ve never heard of Canson tracing paper before. It is much less expensive that the “Swedish tracing paper” that I’ve used for some time. I may have to give it a try. I’ve also never tried freezer paper. Looking forward to your upcoming posts, Sarvi! My recent find: Garbage bags! 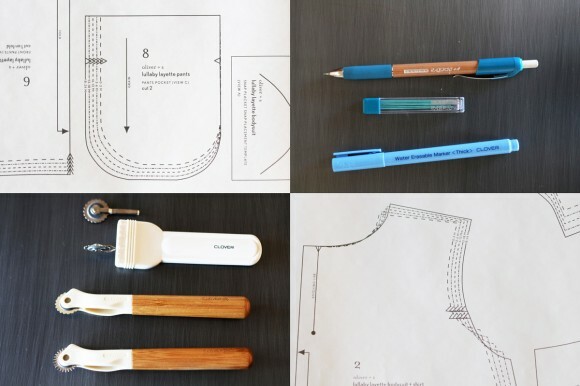 They “cling” to the paper pattern and you can use any permanent marker to trace your pattern! It’s seriously amazing! YAY!! I have always wondered about this! I cut my patterns (eek!) to the largest size, then cut under the pattern to the size I want. I works, but I know there MUST be a better way! Cant wait for this! I use greaseproof paper and a pencil to trace patterns. The greaseproof paper is super cheap (less than $2 in the kitchen section at the supermarket), transparent enough to see through with no need for extra lighting, and a little stronger than the tissue paper regular patterns are printed on. The only problem with it is that it is only 30cm wide, so if your pattern piece is wider you need to stick it together with magic tape (NOT normal tape as that will shrink over time, you can also draw over the magic tape). I love hearing about all these different materials, sewists are clever folk! And Jay, thank you for mentioning that about using tape, that reminds me that it’ll melt if ironed if you use it with freezer paper, off to make a note to that effect. I trace because I plan on using these very nice patterns for years… and i have 2 girls, so I buy both pattern sizes so that I can work my way up through. I like classic well done designs and not having to buy patterns over and over is a huge plus. I would LOVE it if O+S would make their patterns where the closely nested pieces have separate pieces… so the 5,7,9 are together and the 4, 6, 8 together – leaving more space between so that it’s easier to figure out what little line goes with which size. I’ve learned that if I ever hit the pattern sale where patterns are $1 each… and find a pattern that I really like… I buy several copies of the same pattern. It’s easier to pay $1 and cut out one size per envelope rather than spending time (and money on the Sweedish Tracing Paper) tracing it out on my own. Took me a few years to learn this! The best thing I have found for adjusting patterns, intermixing patterns…. is 5 ml plastic vapour barrier used in construction. It is economical and a roll will last a long time. The clear plastic is easily seen through. I also use a Sharpie Pen to draw with. Once dry is permanent. The plastic is also very durable. Kate, where do you find this product? I’ve never heard of it and am quite curious about it. I purchased ours a Home Depot, a good hardware store would have it. It is used as a vapour barrier when constructing homes. It is a cost effective sheet of plastic an it is so great for layering and adjusting patterns because you can see right through it. Is the title I copied from Home Depot website for the product. It is about $30.00 dollars a roll and my first one lasted about 10 years. It is thick enough that it won’t stretch, even for fitting, lining up patterned fabric is easy too. So there are different thicknesses mine says heavy weight on the outside. Lowes has it as well. Hope this helps.